What Is A Dry Lake? Dry lakes are commonly found in arid and semi-arid landscapes. Also known as a playa, a dry lake occurs as a depression with a dry lake bed where evaporation leads to drying up of a standing surface body. Dry lakes are a common occurrence in arid and semi-arid areas. They are an indication of climate changes as experienced. They are classified into salt flats and alkali flats depending on the compounds deposited on the dry lake bed. A dry lake remains dry through the most part of the year, and fills up with water when rain falls. The water then dries up during the dry seasons via evaporation. Majority of dry lakes across the globe are small. New Mexico and Texas contain the highest number of dry lakes in the world. How Is A Dry Lake Formed? A depression or a basin, and a water source, rainfall or others, are the essential requirements for formation of a dry lake. A lake is formed by the inflow of water into the depression. In the event that temperatures rise the rate of evaporation from the water surface is higher compared to the water inflow. This leads to the formation of a dry lake. As water is lost, salts which are mainly borax and sodium bicarbonate precipitate out and continue building up as more water evaporates. Eventually, a bed of clay and clustered deposits of salts are left behind. The characteristics of the dry lake bed depend on the levels of water initially occupying the depression. 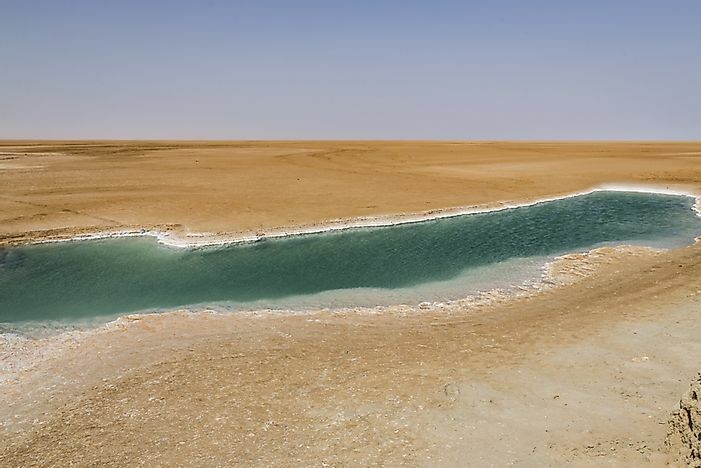 With thick water, both evaporation and wind play a role in loss of the water leading to desiccation and formation of cracked-mud dry lake bed. Smooth and hard beds are a feature of shallow waters where only wind leads to water loss. There are cases of formation of dunes on the beds of dry lakes with very little water. Famous for its use in satellite calibration in orbit, Salar de Uyuni is the largest salt flat in the world covering a 4000 square miles in southwest Bolivia in close proximity to Andes Mountains. Another famous dry lake is the Racetrack Playa with a defining feature of large rocks across the lake bed. It is found in California, at the Death Valley. Other notable dry lakes are the Bonneville Salt Flats and the Edward Airforce base situated in northwestern Utah and southern California respectively. The Edward Airforce dry lake is known for military and research aircraft testing operations. The changes associated with dry lakes in terms of the durations taken to dry up are an indication of climatic changes in the arid and semi-arid areas. A close examination of the changes can provide vital information regarding the climate alterations across the year. Dry lakes present good and reliable sporting avenues because the lake beds are often hard and smooth with extremely flat surfaces which make them ideal for motorcycle and bicycle related sports. The salts that precipitate out and are left behind on the lake beds are sometimes rich in mineral content. Thus, dry lakes especially the salt flats have been widely exploited for mineral resources. Lithium, a mineral with a wide application in battery manufacturing has its sources linked to dry lakes. Searles Dry Lake is known for a rich mineral content ranging from potassium, sodium and halide compounds.